More often than not, college student government associations are farcical and ineffective organizations disproportionately led by kids who are attracted by the allure of vapid popularity contests and who are, at the same time, both too vainglorious and too naive to ever recognize their titles and responsibilities are completely worthless. That’s a mouthful, and I know, it may sound like a major burn. Don’t get me wrong: It’s certainly not a universal rule. My dad was the president of his high school student government, and he was a radically genuine human being. And I was always impressed by the humor and professionalism of my law school classmates who were elected members of our student bar association. But, to be sure, I’m not really referring to high school or graduate school associations. College student government is much more important, at least in the skewed hierarchy of campus life, and usually, it’s just a cheap and pathetic simulacrum of real government. This week, the young leaders in charge of Louisiana State University’s Student Government Association attempted to do something bold and innovative and desperately needed. For the first time, the LSU Student Government published a “Louisiana Legislature Higher Education Report Card.” Yesterday, I received multiple messages from LSU graduates encouraging me to read the SGA’s report. “Isn’t it great LSU students are putting out a report card?” one friend asked. “It’d be a lot better if they had even the slightest idea of what they were actually endorsing,” I wrote back. According to the report card, the Louisiana State University Student Government Association is publicly supporting a completely unnecessary $1,600 annual fee per student. For some bizarre reason, the LSU SGA gave failing grades to legislators who opposed completely unnecessary increases in school fees. Put another way, the LSU SGA actively and purposely penalized legislators who sought to eliminate those new fees. If legislators voted for those fees, the LSU SGA gave them a positive score. It makes very little sense. Sure, that $1,600 annual fee will become a tax credit refundable to the state, as a cynical way of offsetting the other fees and taxes, but there are serious concerns that the tax credit may also need to be included in a personal income disclosure to the IRS. Who is it intended to benefit? Me, the student or Bobby Jindal, the candidate? The whole scam wasn’t well-considered, yet for some inane reason LSU’s SGA decided to score these votes. Their test has no rhyme or reason. Mike Johnson and Karen Carter-Peterson both received Fs. It’s lunacy; it’s inconsistent; it’s unsophisticated, and it’s fundamentally unfair. Zack Faircloth, a junior, was one of the chief advisors. 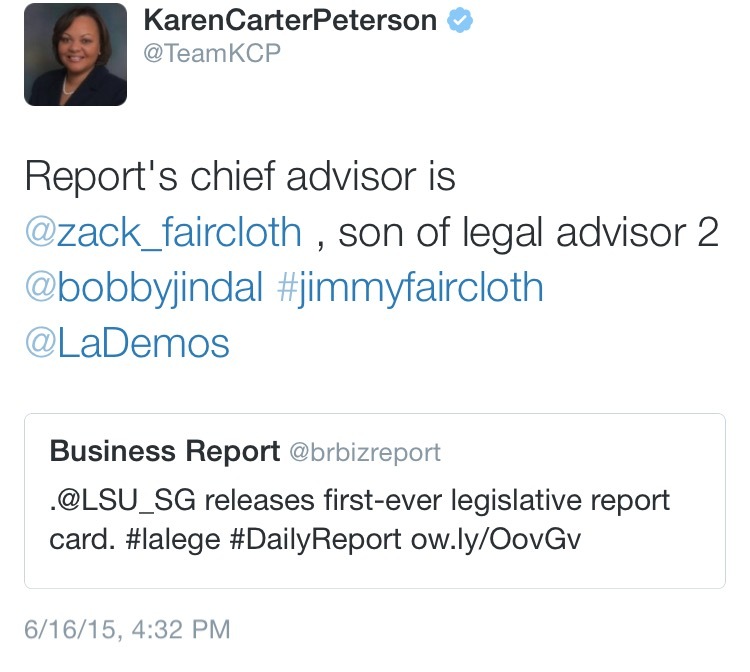 Considering the way the scoring was computed, it’s probably important to note that Zack’s mother is a Jindal appointee on the University of Louisiana Board and that his father, Jimmy, was once Gov. Jindal’s executive counselor and remains one of his top legal advisors and closest friends. To the best of my knowledge, this was never properly disclosed. I call on Mr. Faircloth and other members of the Student Government Association at LSU involved in this bogus project to resign immediately. No one can ever trust your integrity. It’s an embarrassment to LSU. Just more evidence that the culture of corruption and cronyism infects every institution in our great state. Let’s give these people credit for being vapid and naive rather than imagining some conspiracy to make heroes of legislators who bow slavishly to the governor – such a conspiracy would imply intelligence not in evidence in the report card .